Rapid developments in the field of genetic algorithms along with the popularity of the first edition precipitated this completely revised, thoroughly updated second edition of The Practical Handbook of Genetic Algorithms. Like its predecessor, this edition helps practitioners stay up to date on recent developments in the field and provides material they can use productively in their own endeavors. For this edition, the editor again recruited authors at the top of their field and from a cross section of academia and industry, theory and practice. Their contributions detail their own research, new applications, experiment results, and recent advances. Among the applications explored are scheduling problems, optimization, multidimensional scaling, constraint handling, and feature selection and classification. The science and art of GA programming and application has come a long way in the five years since publication of the bestselling first edition. But there still is a long way to go before its bounds are reached-we are still just scratching the surface of GA applications and refinements. 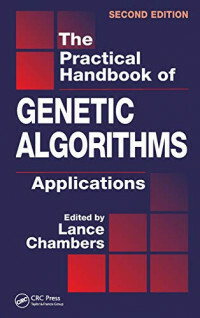 By introducing intriguing new applications, offering extensive lists of code, and reporting advances both subtle and dramatic, The Practical Handbook of Genetic Algorithms is designed to help readers contribute to scratching that surface a bit deeper. excellent service at every level.